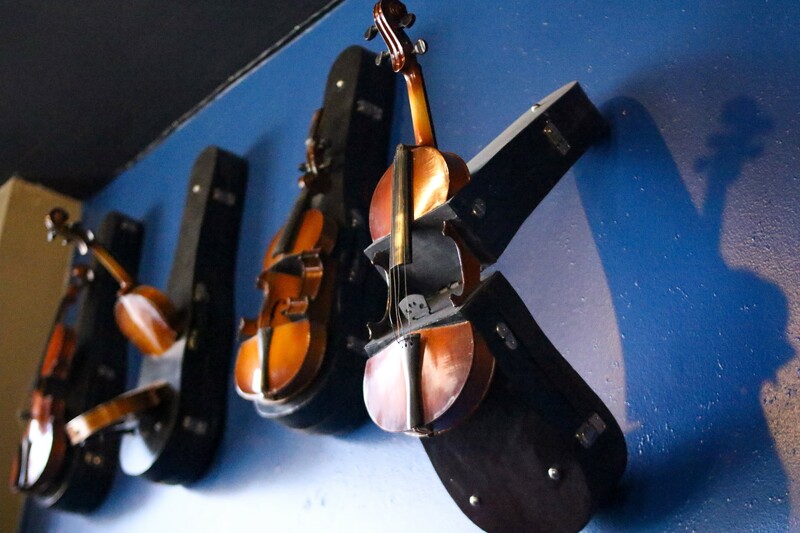 Four Strings' patron saints — Dorothy, Rose, Blanche and Sophia — look out over the barroom. 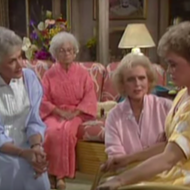 Golden Girls lovers unite! 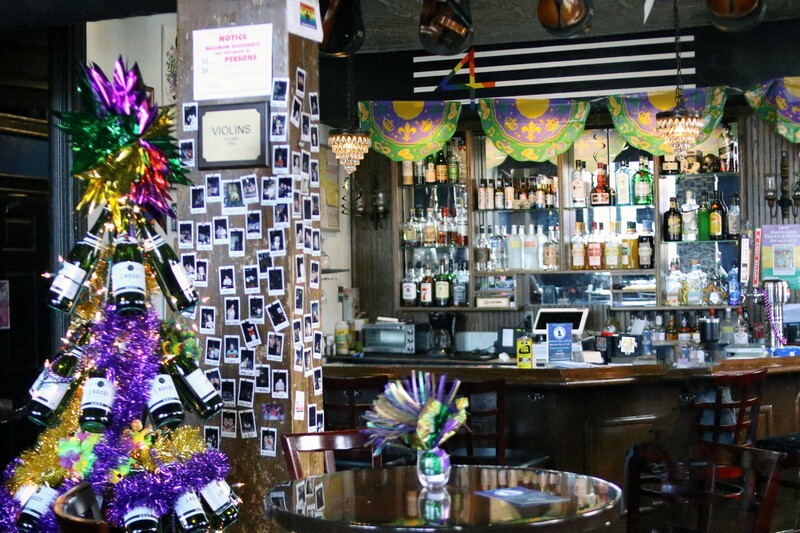 Four Strings (1730 South 8th Street, 314-312-6030) is a "straight-friendly" gay bar that owes its existence to the beloved late 1980s sitcom — and pays homage to it with plenty of Golden Girls tchotchkes. 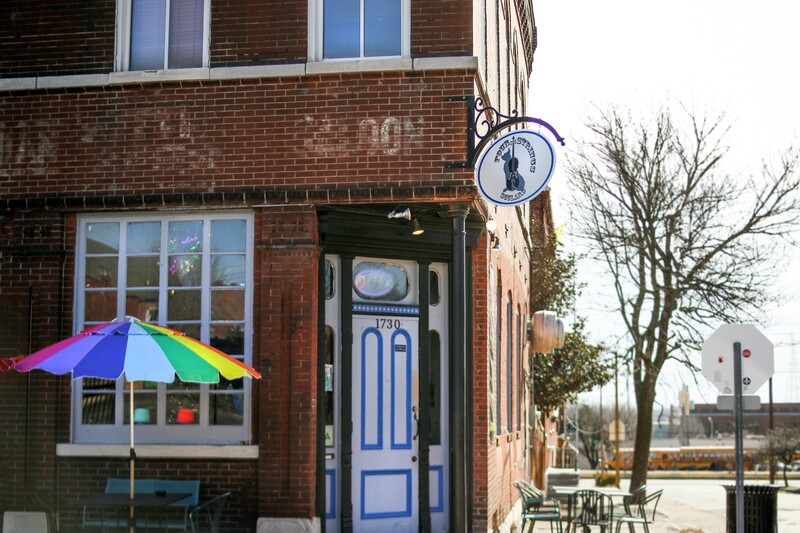 Located in the Soulard storefront that held Twisted Ranch before it moved to a bigger space, Four Strings is owned by Webster University professor Jason Fossella, bartender Joe Zydiak and Mike Hartnett, a former real estate agent. Zydiak, who tended bar at the Livery Co., the Grey Fox and Keypers Piano Bar, had dreamed of opening a place of his own. At the Grey Fox, he got to know Fossella, a regular at happy hour, where the two spent many long hours watching, yes, The Golden Girls. Eventually, they decided to open a bar together, with some help from Hartnett. 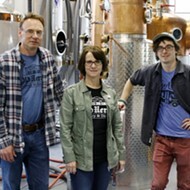 Last July, Four Strings opened its doors. Walking in, you'll spot Golden Girls items everywhere, from board games and collectibles to a commissioned portrait of the ladies themselves. Zydiak and Fossella even invented a drinking game based the show. You can find the instructions hanging on the wall. 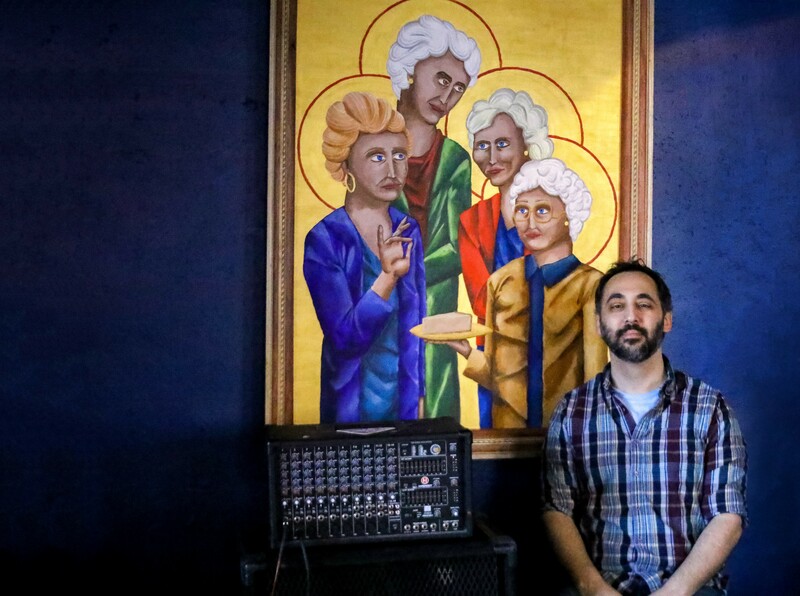 Co-Owner Jason Fossella poses proudly with a commissioned Golden Girls piece hung in the bar. 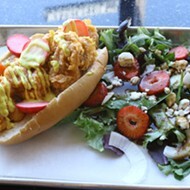 The fun extends to the kitchen offerings, which are like state-fair food meets bar food. For dessert, try "Deep-Fried Whorey-Os" or "Deep-Fried Cream-Filled Twinks." You can also devour burgers, sandwiches, wings, pizzas, apps and more. Vegans, they have you covered with kale burgers, black-bean burgers and pizza. There is always something happening at Four Strings. On Mondays, you can join the Sip and Song Parties hosted by TwistedTreble.Rocks, which teaches attendees step-by-step how to write a song. Everyone leaves with their own original song. Tuesdays are open mic nights — the perfect opportunity to perform that new song. Wednesdays are karaoke, Thursdays are drag and jazz, and Fridays and Saturdays rotate between live jazz and folk music. On Sundays, Annie and the Fur Trappers perform. 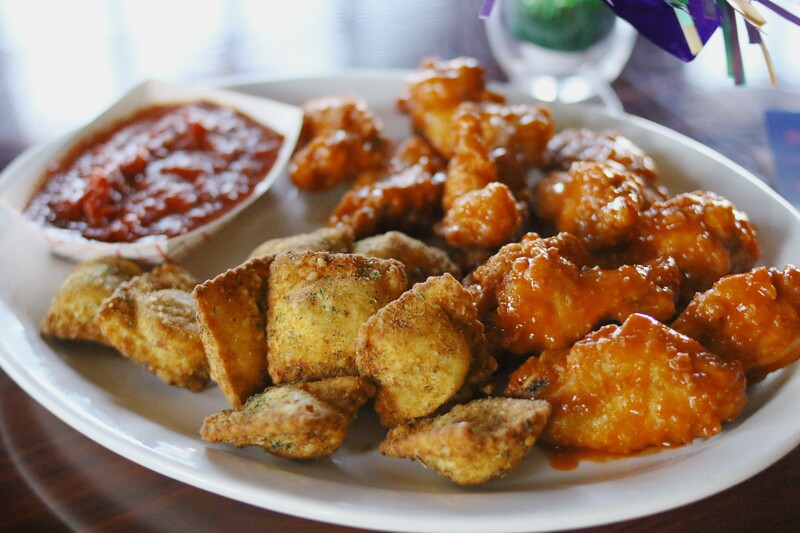 Toasted ravioli and bone-in hot wings will keep you filled out for drinking. The "Bitchy Brunch" menu is full of hearty breakfast options like biscuits and gravy and breakfast pizza. Most importantly, for $12, there are bottomless mimosas. Four Strings also offers what may be the cheapest happy hours in town — $2 beers and $2 wells from 3:30 to 7 p.m.
Customers are having a great time — and so are the owners. "It is rewarding to see my ideas coming to life for people to enjoy," says Zydiak. 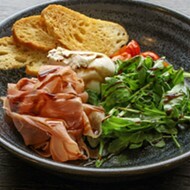 Says Fossella, "It is all about good food, good music, and cheap drinks." 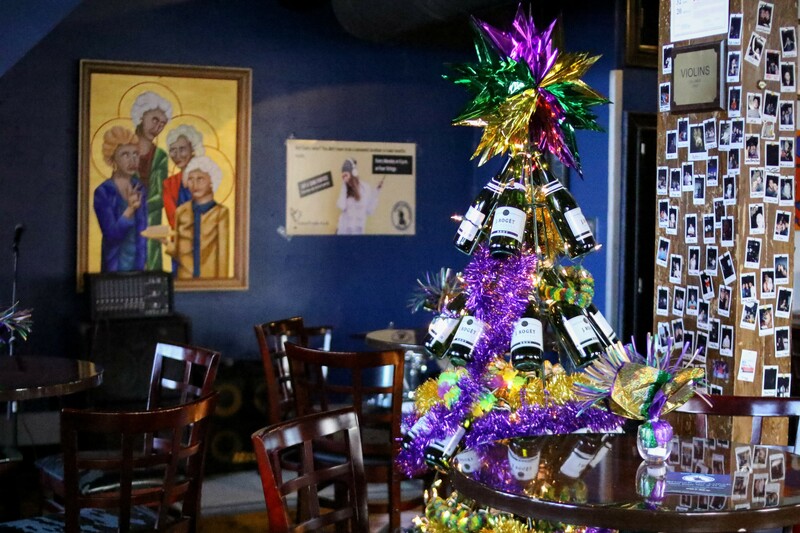 Tickets to Four Strings' Mardi Gras party are almost sold out. Rise and shine because doors open at 7 a.m. A $50 ticket includes unlimited rails and domestics. The drag show after the parade will be hosted by "Kyra Banks, three queens from out of town and some hot guy in a speedo," says Fossella. Drinks will also be sold outside. Four Stings is now open earlier, from 11 a.m. to 12:30 a.m. on weekdays and 11 a.m. to 1:3o a.m. on weekends. Mardi Gras colors keep the curved bar lively. Violins give a jazzy vibe. 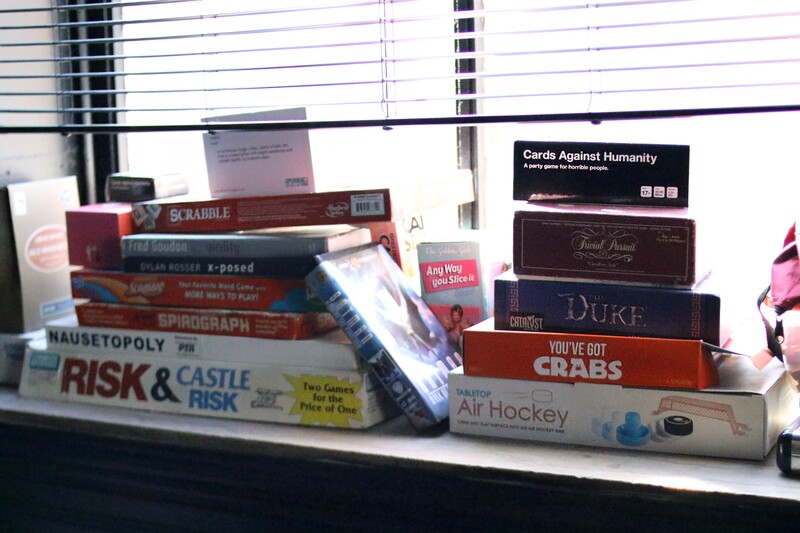 Board games are stacked by a window.